Hello everyone. Sorry, that I haven’t presented the solution to last Friday’s challenge yet, but I have been a bit under the weather and traveling, so I have been unable to get to it. I had two great submissions from Don and Pete and they matched pretty closely to my solution. However, mine has a few cool features that I wanted to share. I will try and post my solution shortly. In the meantime, I wanted to tide you over with something to think about. In today’s Friday challenge, I present to you with this user conundrum. Although it appears to be easy upon reading, it may throw some of my readers for a loop when the sit down and try and recreate it. “I am looking to create a stacked bar with distribution within a given range for seo keyword performance reporting. Say there are 10 keywords we are tracking. This would be one month – one plot on x axis. 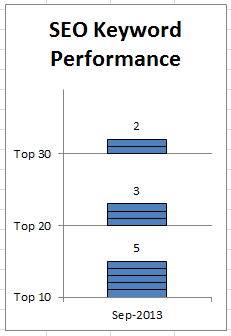 2) Take it a step further and send me a better chart than my solution. If you want to send me a submission, simple leave me a comment and one of the fields is your email address. I will then send you my email so that you can send me your submission. 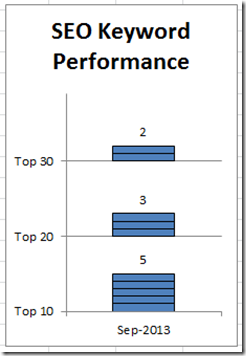 I will post the submissions received and also how I made this chart in Microsoft Excel next week. Good luck! My replication of the chart has been submitted. Get some rest and I hope you get feeling better soon. 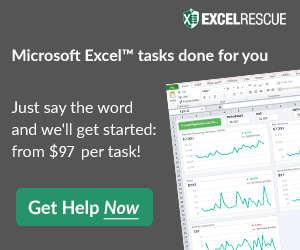 I just found out that you have to open my workbook in Excel 2013. Excel 2010 does not show the stacked bar correctly.